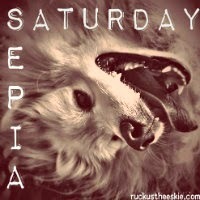 Ruckus the Eskie: Sepia Saturday #77: A Little too Hot Now, Buddy. Summer is creeping in with the 90+ degree weather. What are you doing wearing that?? Adorable! Summer sure is coming, but your hat is very nice. Oops! Looks like my link went haywire! Not much you can do in the heat with a coat like yours. We've had weeks of nothing but 90's, but now they are saying "triple digits"! Last night at 10:30 PM it was 82. Oh well, in a few months the Humans will be complainin' about the LOW temps! Ruckus looks happy in that hat! Let him wear it if he wants to.